This Enzo was being displayed at the premiere of the movie "Redline". 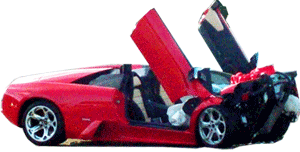 The star of the movie, Eddie Griffin, wrecked the Enzo by accident while doing a film promotion. 2003 Ferrari Enzo. Happened in Hollywood, California, USA.